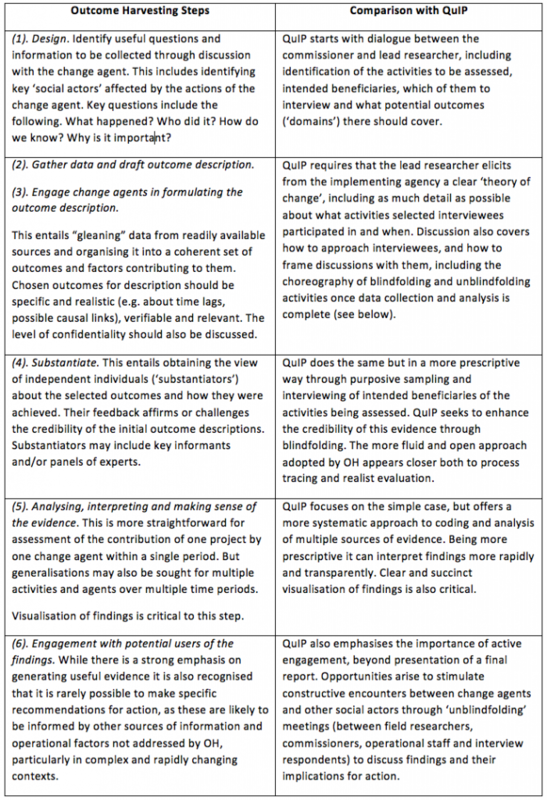 These commonalities with QuIP, allowing with more detailed differences, can be elaborated by looking in turn at the six iterative steps of Outcome Harvesting: (1) Design, (2) Identification and drafting of outcome descriptions, (3) Engagement with change agents in finalising these, (4) Substantiating outcome descriptions through consultation with independent agents, (5) Analysing, interpreting and making sense of the evidence, (6) Engagement with potential users of the findings. See the table below. Overall, this brief comparison suggests to me that the values and philosophy underpinning OH and QuIP are very similar. In aspiring to produce evidence that is credible and useful to actors in complex contexts both implicitly counsel against pursuit of universal truths and perfectionism (including spurious precision, or what Mansky calls “incredulous certitude”). Both also recognise the limitations of having to rely on the cooperation and perception of stakeholders in any change process, but also appreciate the ethical as well as practical benefits of eliciting and comparing multiple perspectives. Both distinguish between evidence of change (‘outcomes’) and evidence of drivers of change, and favour starting with the first and working back to the second. There are also significant differences. While OH is more detailed and prescriptive than Outcome Mapping (see footnote 13 of UNDP, 2013) it is significantly broader in scope than QuIP – e.g. in addressing recurring monitoring needs alongside the need to assess impact of specific interventions. QuIP is also more narrowly focused on securing the feedback of intended beneficiaries, in a way that is more transparent and open to auditing by third parties. OH, in contrast (and like process tracing) appears more tailored to assessing individual efforts: e.g. in advocacy, campaigning and policy engagement. Of course generalising about relative strengths and weaknesses is dangerous, note least because niceties of methodological design often turn out to being less important than how carefully and skilfully different approaches are actually implemented. More specific features of the QuIP, including blindfolding, separation of data collection and analysis, and systematic coding were introduced explicitly to mitigate potential for bias levelled at qualitative impact assessment methods. OH has less to say in this regard, and perhaps therefore less to offer, but thereby is more open. For this reason it would be more accurate to describe QuIP as a form of OH than the other way round, and as a narrower approach that could be incorporated into an OH. Overall, the key point is perhaps that they are mutually affirming approaches that belong to a broad family of more qualitative and interpretive approaches to assessing change. This takes me back to the point with which this blog opened – that for all the confusion of terminology and acronyms there is much to be gained from the existence of a plurality of approaches to assessing change. Attempts to list, review and classify different approaches more systematically for different fields can be useful – e.g. see Befani (2017), Spaggiari (2016) and of course the BetterEvaluation website. But if we accept the benefits of practice that is attuned to diverse, complex and evolving needs then we should neither expect nor hope that any overarching review will ever be definitive.